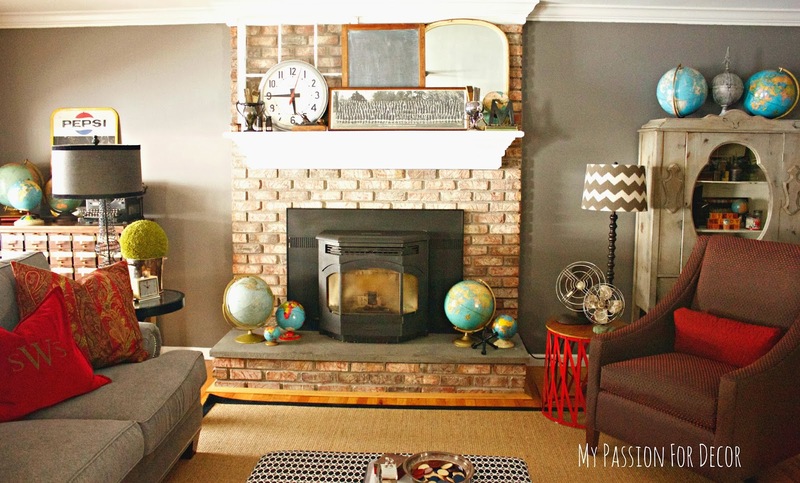 Today, I'm finally sharing a tour of my family room in our new house. I've been meaning to take pictures for weeks, but then something else would come up and I wouldn't get around to it. However, this week I got very serious about the tour when I found out we were moving. Yes, you read that right...we are moving again. My very smart, hardworking and amazing Hubby got a new job with his company in Chicago. I'm so proud of him and how hard he has worked to achieve all he has. It's great he's getting this amazing opportunity, but it's bittersweet. We love our house, our neighborhood and the friendships we've formed while living in CT. In the almost 6 months we've lived in our house, it has become our home. I've worked many long hours turning this house into OUR home and not a house we bought from someone. Yes, I know I can do this all again, but I have to admit it's a lot harder this time! SO while I can, I'm taking pictures to document the house I truly love. Thank you to Charlotte of Ciburbanity for encouraging me to do this. At first when I found out we were going to have to sell the house I didn't want to take anymore pictures, but Charlotte pointed out that it's a great way to document what we've done here and memories for Hunter when he gets older. The family room is our favorite room as a family. It's warm, cozy and a place we spend a lot of time cuddling, staring at the fire, talking and watching movies as a family. 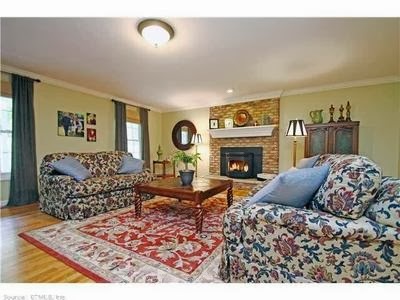 Here's a picture from the real estate listing. The room was this color when we moved in and the curtains and roman shades were also here. Everything else of course was the sellers. This is a BIG room. It's deceiving from this picture because you can't see the entire room. The first thing I had to do was change the color of the walls. The color was too greeny yellow for me. 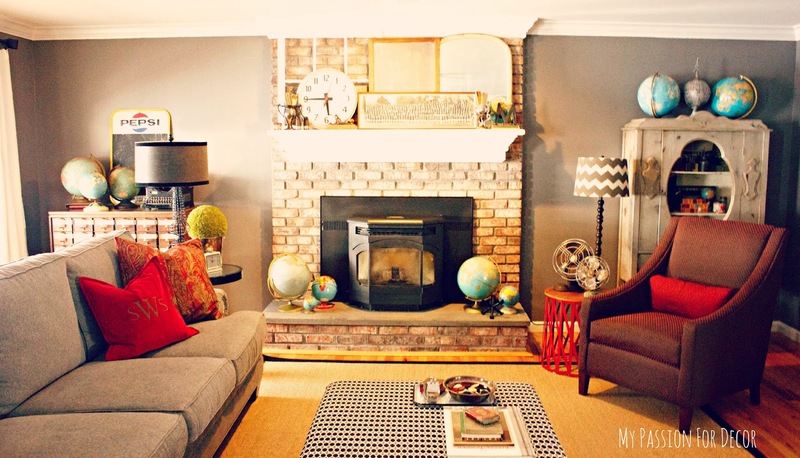 I wanted something that was warm, cozy and had a masculine feel. I am the only girl in a family of men. Even the cat and dog are male! The color I chose was the same color I chose for the kitchen ceiling...Cinder by Benjamin Moore. It's interesting how the kitchen looks different than the family room, even though they're the same color. The lighting is a lot different in both rooms. Now, no matter what I do I have a hard time photographing this room. Reds are hard to photograph I'm figuring out and also, this room doesn't always get a lot of light. On the day I took these pictures the light was perfect, but the pictures still didn't turn out the way I had hoped. When You walk into the room this is one of the first things you see....our massive brand new section that we LOVE and our new dark slate grey and tiny red polka dot chair that we also just purchased. We had our other sofa for 15 years, so it had lived a long and happy life. It was still in great shape, but I was ready for a change. Here's the room looking toward the entrance from the foyer and the front entry. 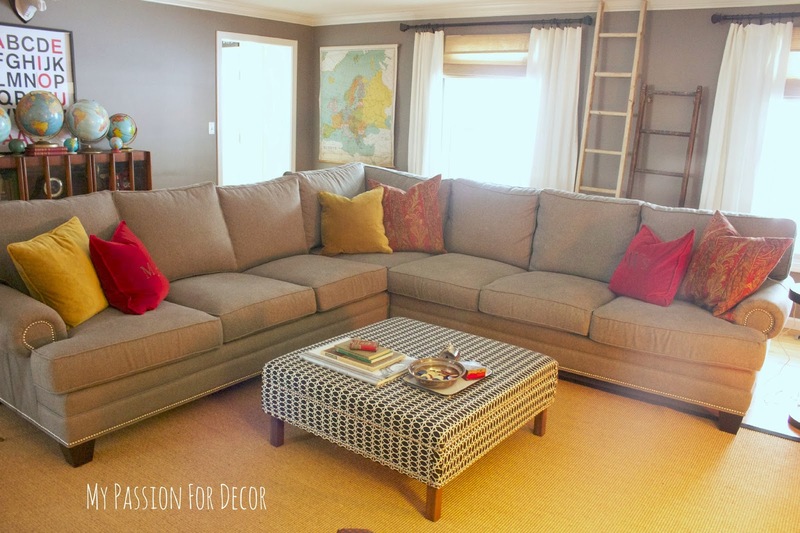 This sectional is so comfy. It's grey with silver nail head detailing. It's a warm, grey fabric that reminds me of a nice men's suit. This is the other side, near the other entrance to the kitchen and eating area. 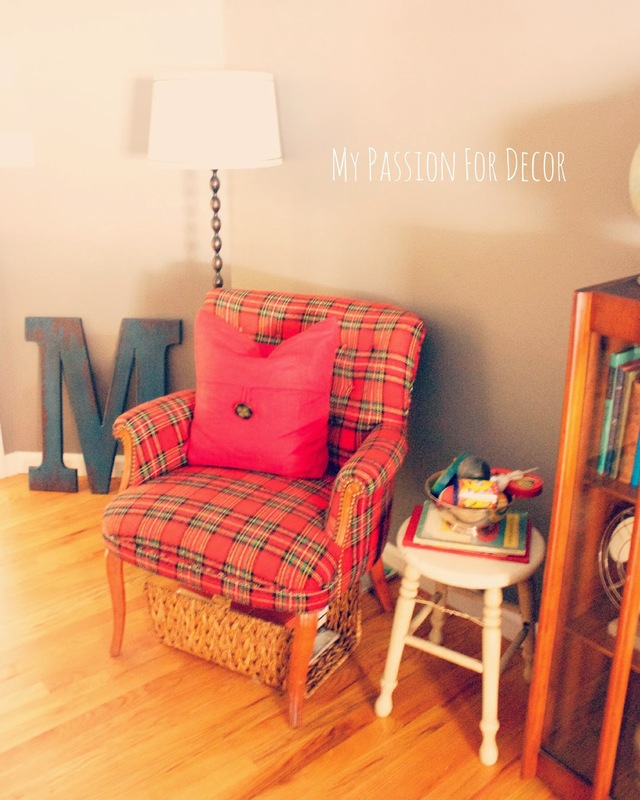 You can see one of my little plaid wool chairs my friend Emily scoped out for me at an estate sale! I love them! 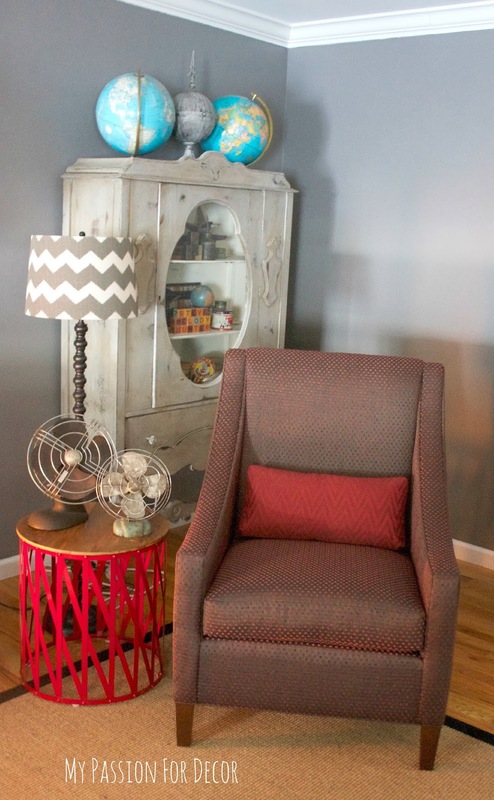 Here's a little bit better picture of my cute red plaid chair. That M I got at Hobby Lobby on clearance and I just set it there because I have no idea where I want to hang it yet. 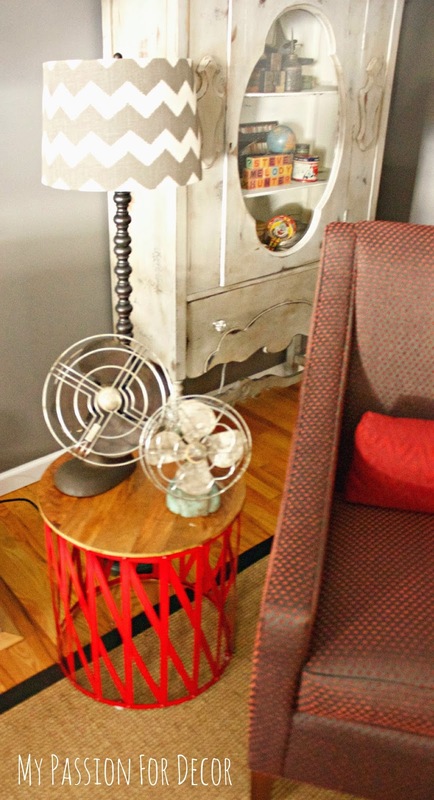 One thing I do like to do in a room is use odd things for side tables. I especially like to use vintage children's school chairs and small wooden stools. This is back on the other side of the room by the windows and my other plaid wool chair. Also, one of my favorite possessions, my old linen pull down map of Europe and my light up globe. Yes, remember I have a globe obsession? You can't really see it, but the globe is on a bent wood children's school chair. This is one of the first things you see when you walk into the room from the front entrance....my beloved library card cabinet. This is on the opposite wall from the windows as you can see from the glare off the TV. 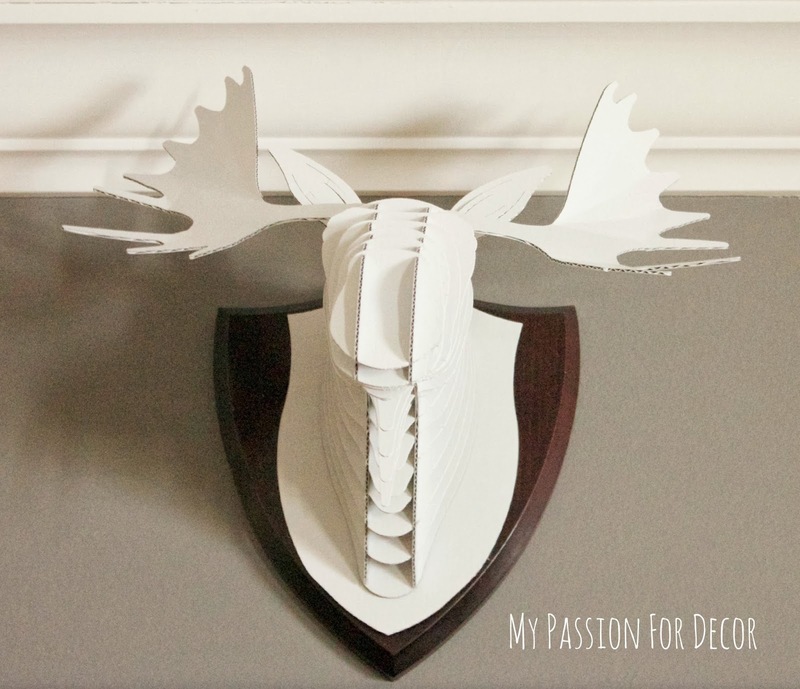 I had really been wanting a white deer or moose head for my wall, but the prices I found were too much. This summer while I was in Atlanta I stopped in at the Pottery Barn Kid's Outlet store and found this cute moose head for $4.99. It was brown cardboard and when I got home I put it together, and spray painted it white. Then one day while thrifting, I found a wood plaque and bought it to hang my moose head on. For about $5.50 I had a much less expensive version. 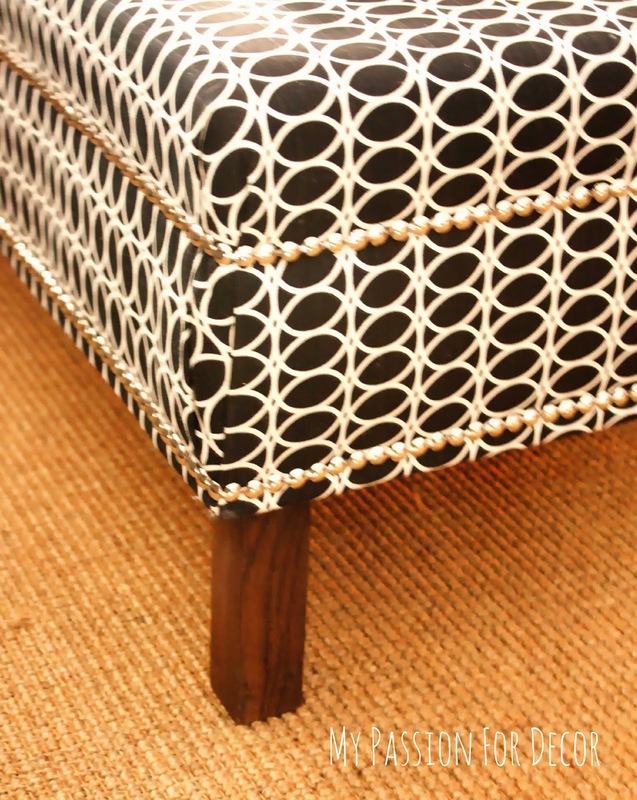 The last thing I really want to point out is this amazing ottoman the hubby and I built from scratch!! This is our first project we've ever done together using power tools, without arguing. I had a lot of fun working with him, but it was a stretch for him to adapt to my 'go with the flow' way of building. He likes to use plans, I like to just wing-it! It all worked out in the end and we had a great bonding time. The fabric I purchased at Joann's and is by HGTV Home.. The nail heads came in strips with every few spaces there was a place to hammer a nail head in. This made it so much easier, but I won't lie....it was still hard to get it perfectly straight! I bought them on Amazon. 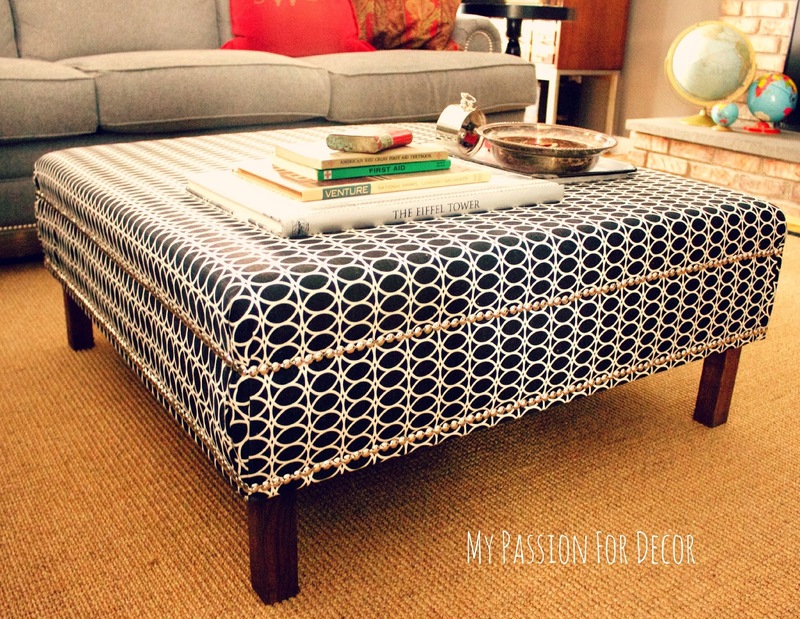 The ottoman is basically 2 sheets of 1 inch plywood cut to size, then the sides are solid pine panels we cut to size. What we really ended up making was a stage. Yes, the hubby might have suggested keeping it a stage and just adding a pole....UGH typical man! Instead, I added 6 inch wood legs underneath the 'stage' by attaching metal leg brackets that the wood legs screw into. 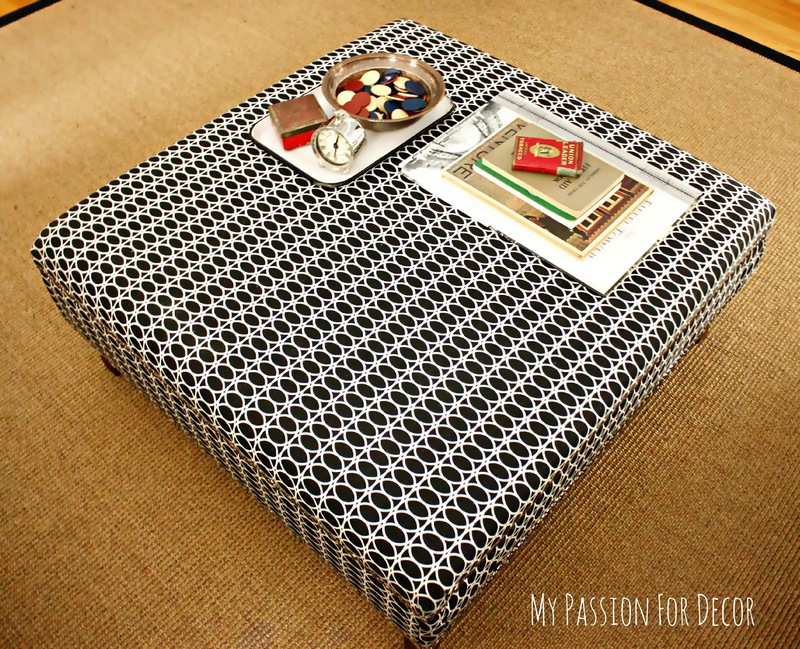 I topped the ottoman with 3 inch foam, batting and fabric. I attached the fabric and batting to the underneath using my brand new air gun brad nailer/stapler. WOW, what a difference that makes!!! So much easier than my little electric staple gun. This this is big. It ended up being 37" X 37" square and about 15" high. 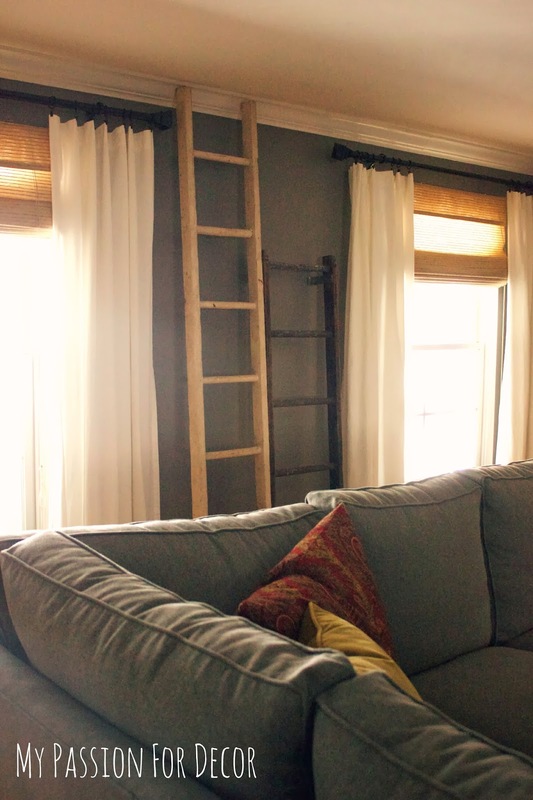 It's a perfect height for putting your feet up at the end of the day. I'm still looking for the right tray to put on top. I want a really big round wood tray, something unique so it might be awhile before I find the right one. I stained the legs with General Finishes Gel Stain in Java. If you haven't tried this stuff yet...you have to. It's the best! I think it's ruined me for any other kind of stain. 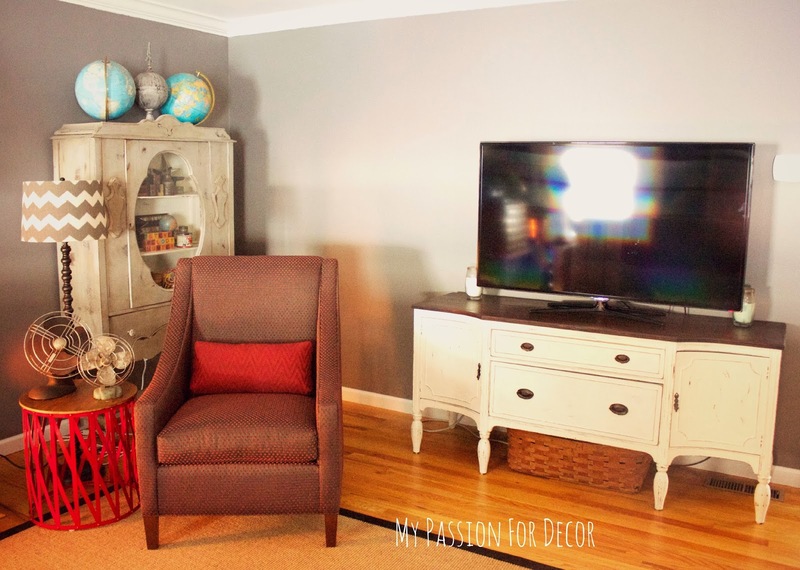 Well, that concludes my extremely picture heavy family room tour! I hope you enjoyed it. I'm sitting on the sectional right now by the fire writing this and I wouldn't want to be anywhere else. Well, I might like to be on the beach since we have over a foot of snow outside right now, but that's not an option right this minute! Thank you as always for reading. I will be posting as much as possible. With everything going on I might not have as much time to devote to blogging, but I'm not going anywhere....well other than to Chicago eventually! If you know of anyone who wants to buy an amazing home in CT, let me know! Awesome, I love your style! Thanks for the tour! Love, love your room. All of your collections are amazing. Best of luck in your move. Your room is so cute and cozy! 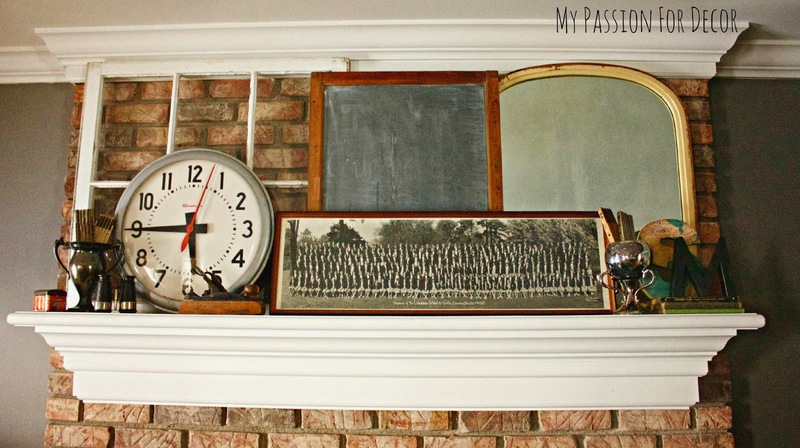 I love all the vintage touches you brought in (and the moose head too, of course.) Lots of luck on your new adventure! Too bad you're going from one snowy region to another! Tell your hubs to get a promotion in San Diego ;). 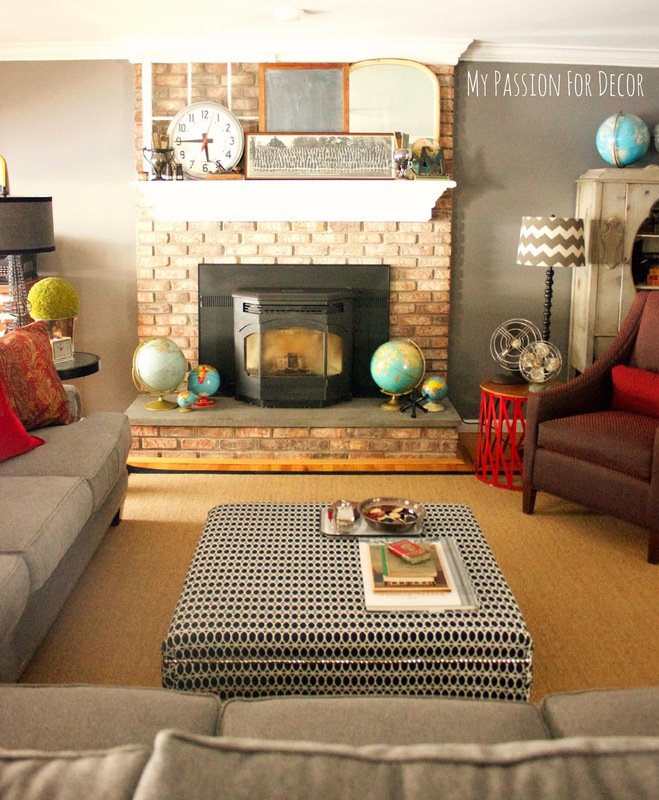 When I saw the first picture I thought that was your family room but truly couldn't imagine that it was your style at all! lol I must admit I was relieved to see the real deal. It's a great room and yes, very large indeed! I know you're going to miss Elephants Trunk Melody, but I'm sure before you know it Chicago will feel like home too. Doreen, yes too bad we're not moving somewhere warm! I grew up in California, so I'd like him to be transferred to Florida or even Texas! I will definitely miss the Elephant's Trunk, even though I only went once last year! I'm hoping I will find some fun places to shop in the Chicago area too. Awww Charlotte, this means so much to me! You inspired me with your complete home tour this week. Also, I probably wouldn't have done it and gotten off the bitter bus without your encouragement. Thank you!! I did make the letter S. I bought one of those paper mache letters and decougaped a map I cut out on top. 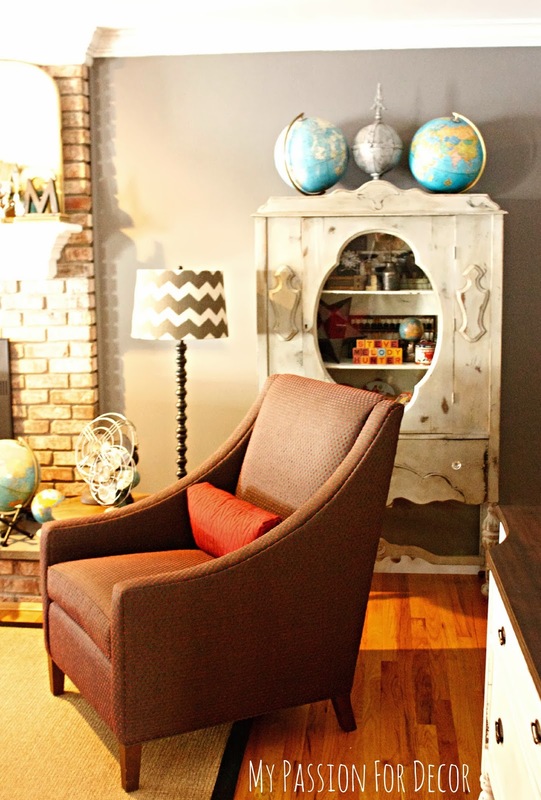 Then afterward I aged it with some Annie Sloan dark wax. 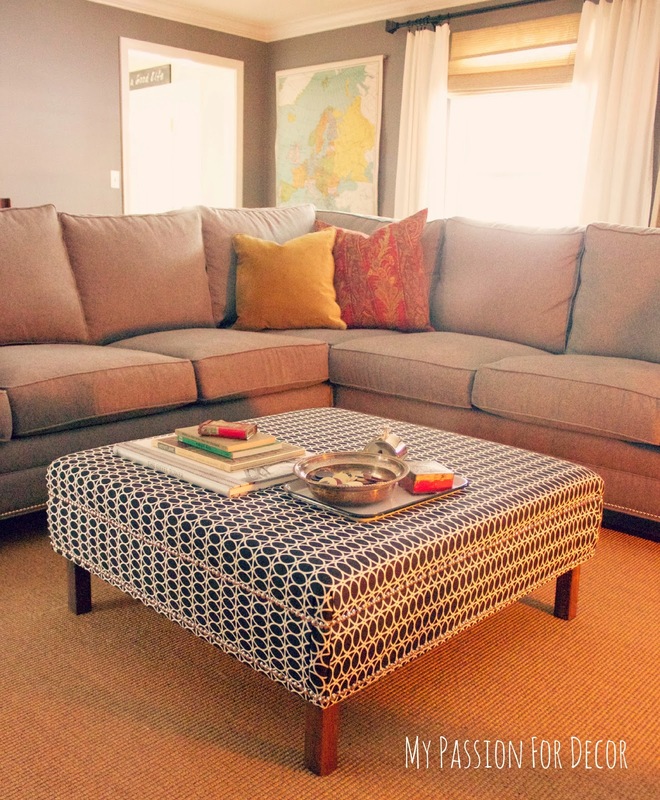 You could always try and do your coffee table with outdoor fabric, or even those adorable coated fabrics they have out now. I saw a ton of really nice fabrics like that at the Country Living Fair. Love your couch. Where did you get it? What color is it? Julie, we got the couch at a local furniture store, but it's made by Lexington. The color is grey and it's a polyester that feels like soft wool and reminds me of men's suit material. So warm and comfortable. The cushions have just enough down feathers in them to make it even more comfy. 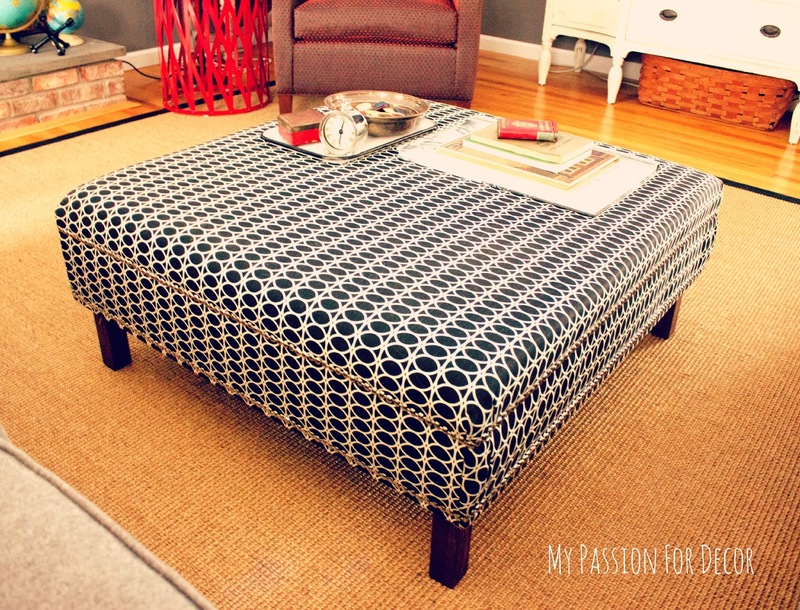 Your living room looks great but I'm really amazed by your ottoman! Love it. Love the fabric too. Thank you Nita! 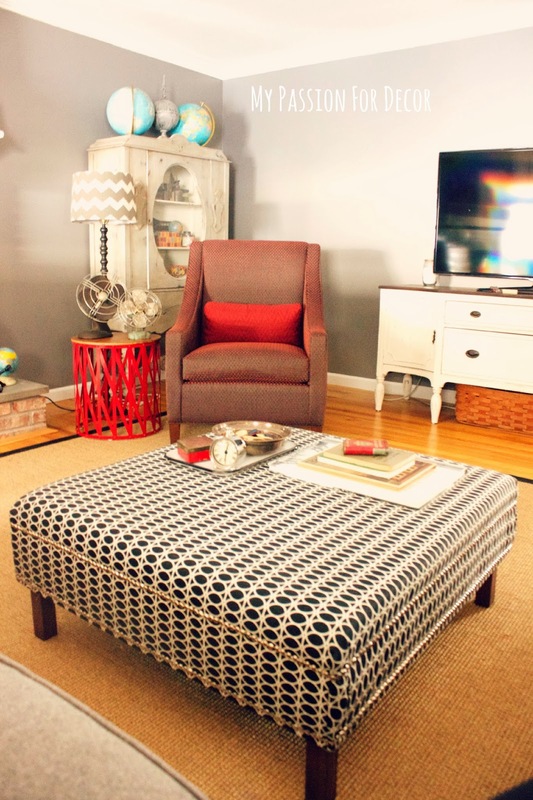 I love the ottoman too. I stare and it and think "WOW, we made that?" HGTV Home has some pretty nice fabrics. Thank you for the comment. HAHA I know, right? It's amazing what a little practice can do. Really though it's practice and the air nailer. HUGE difference. No pounding in staples anymore. I was skeptical because we got the nailer at Harbor Freight for $22 and I think we paid $50 for the compressor last year from HF too. WELL worth the money! Hey there - sorry to hear you have to move AGAIN! Just wanted to tell you that I really love the family room. I am jealous of your ability to pull it all together like that. So funny - our styles really overlap in some places and diverge in others. 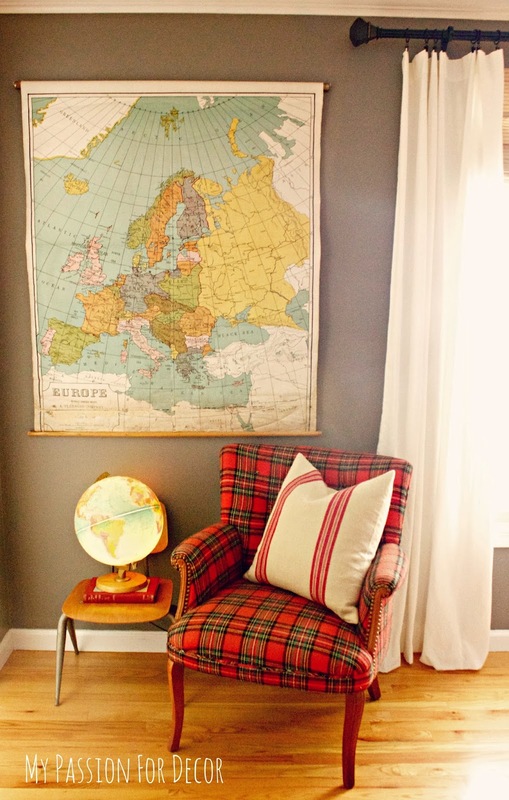 I am absolutely WILD for the red plaid chair, the globes, the card cat., the alphabet sign, the pulldown map (i have one of my own county), and a bunch of other stuff, too - there are a couple of pieces that aren't my style at all - but that's what makes life interesting, right!? 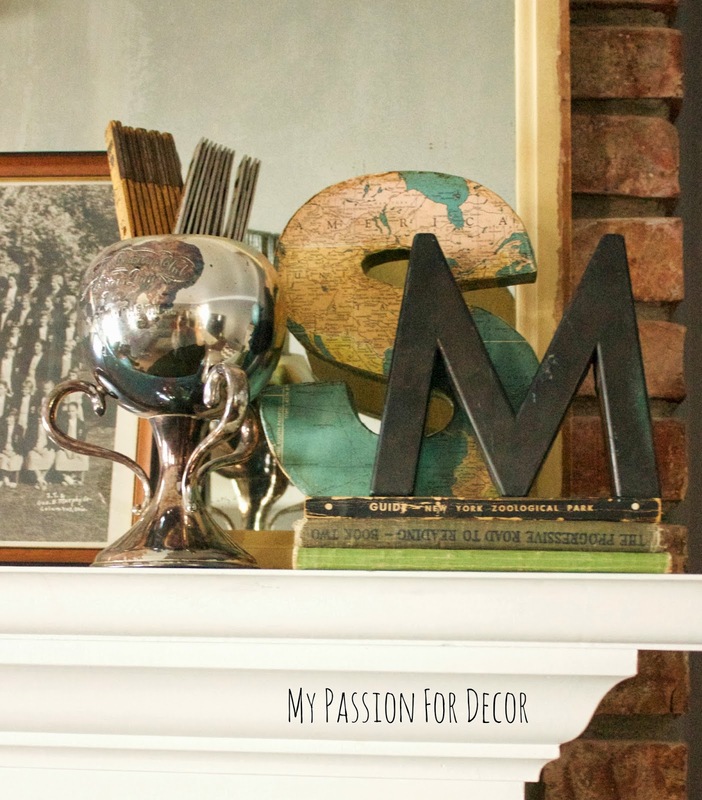 I've been severely lacking for inspiration for my living room mantel and I amy just be stealing some of your ideas! Good luck with the move, Melody! The room is beautiful. Your whole house is. It should be easy to sell.. As someone who has moved a lot, I understand how hard it is to constantly rip up your roots and go.. but soon Chicago will feel like home too. Hang in there!! 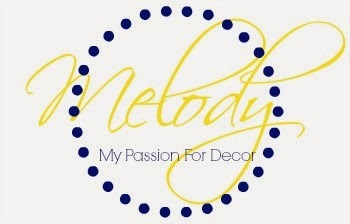 Melody I love everything you did to make that room your own. The good thing is you can take it with you. I have a friend from High School whose husband's job took them many places. She has always found a way to get involved in her community. We graduated H.S. in 1974 Way back then. I hope you too find a way to become part of your Chicago neighborhood. I am so impressed with her positive attitude and yours also. Chin up. Think how fun it will be shopping for the new home!! By the way she lives now in Forrest Park. 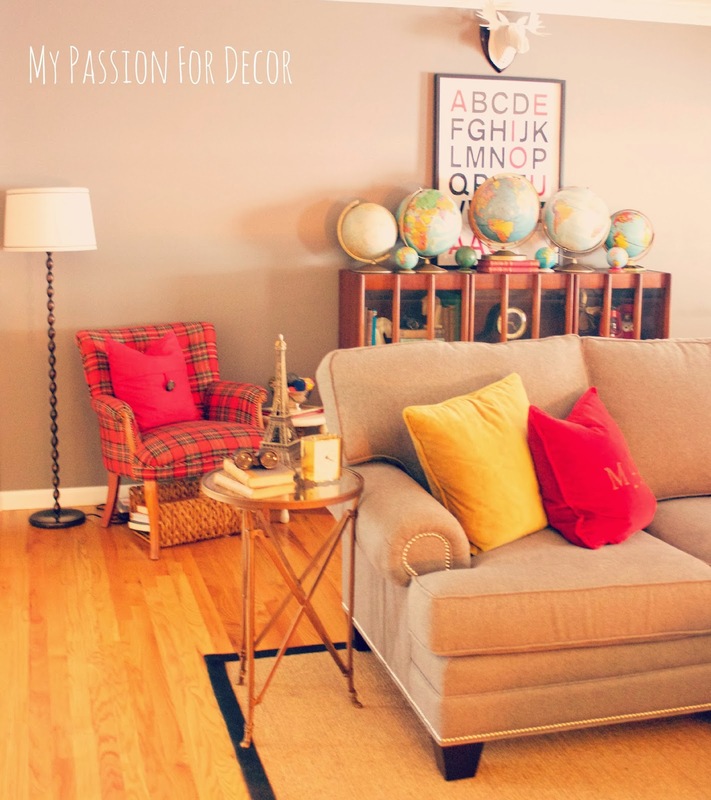 Hi Melody, I just found your blog via Hometalk and I am in love with your decorating style! I can't wait to peruse some of your older posts! We have a lot in common as far as the collections and things we love... I also have a globe collection (although not as grand as yours! 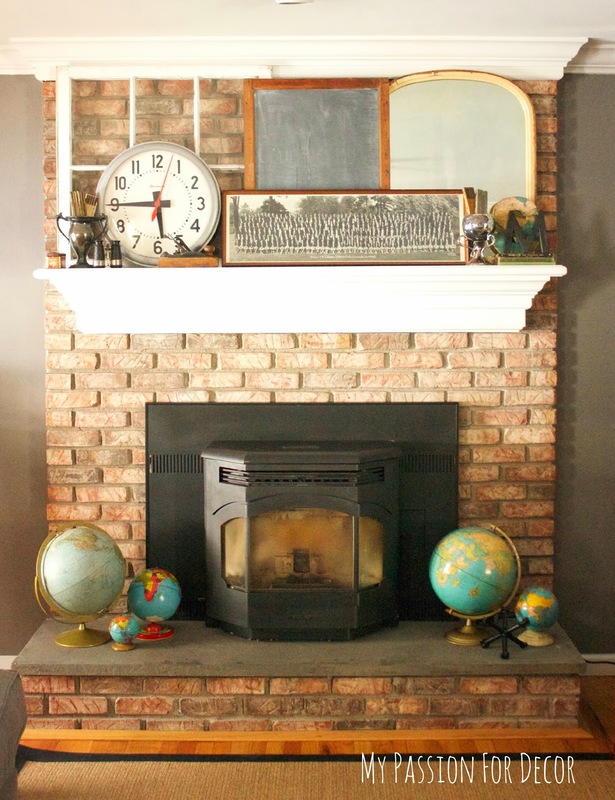 ), I have several old wooden ladders, vintage children's chairs, a big grey sectional (although mine is from IKEA), and a small collection of the panoramic pictures like you have on your fireplace mantle! I saw you mentioned that you were looking for a large, round, tray for your ottoman. 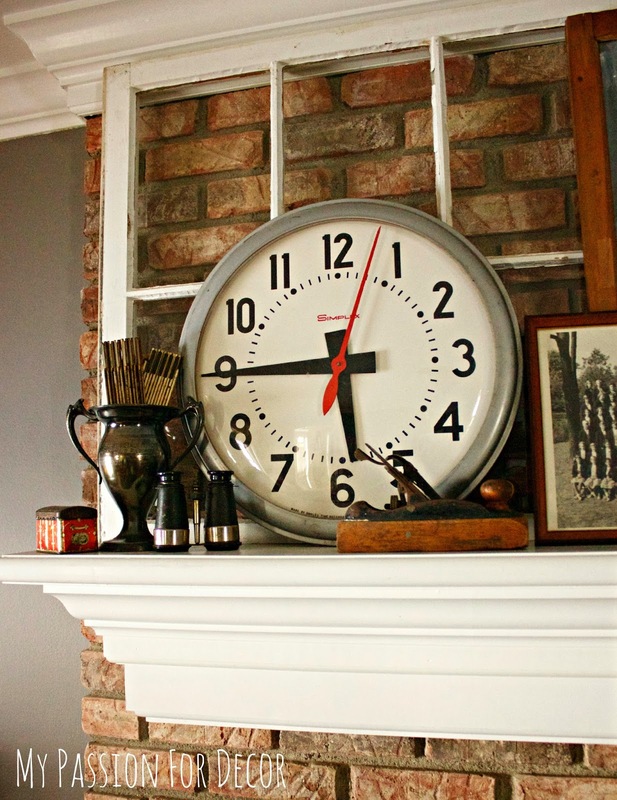 Have you seen this one at The Wood Grain Cottage? http://www.thewoodgraincottage.com/2014/01/02/diy-large-round-serving-tray/ It might even look cool if you stained it a red color to go with your decor! Thank you Tania! I'm hoping that I find a great home in the Chicago area and make some great friends there as well. I absolutely adore this room! We are teachers here and this totally sings to us! Where did you get all the globes? I even looked in my school basement and couldn't find any. Ha Ha! This room is just beautiful! Thank you Trina. 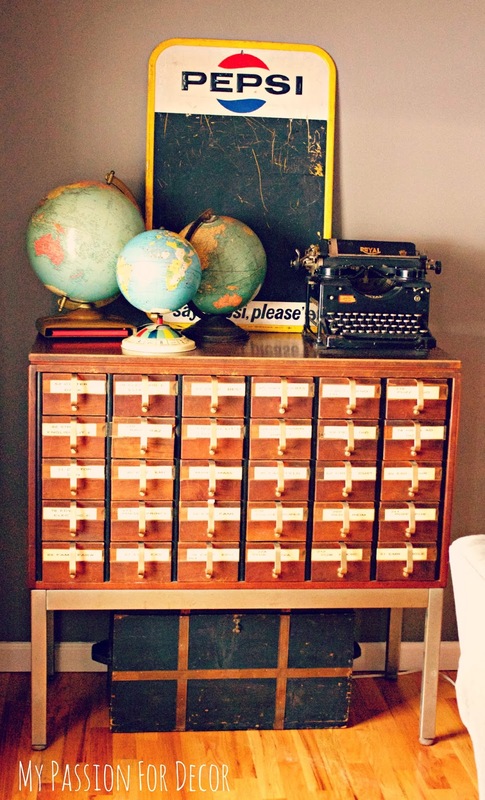 I got the globes at thrift stores, flea markets and Craigslist. When I see them I snap them up! You did a beautiful job. Can't wait to see what you do to your new home in Chicago. Chicago's gain! That's my area and it is great here. Thank you Susan! I'm hoping I can find a home I love as much as this one in the Chicago area. I'm a stay at home Mom and married to the best Husband around. 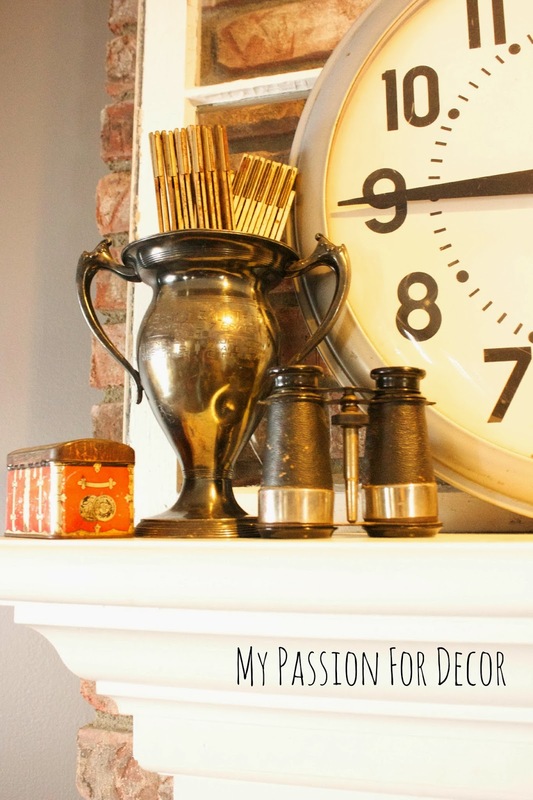 I blog about my addiction to anything vintage and incorporating these vintage items into my home. I take the old and give it a new lease on life. What some might consider a piece of furniture ready for the trash heap, I see an ugly duckling that can be transformed into a beautiful swan. I'm a lover of estate sales, yard sales, thrift stores and flea markets. 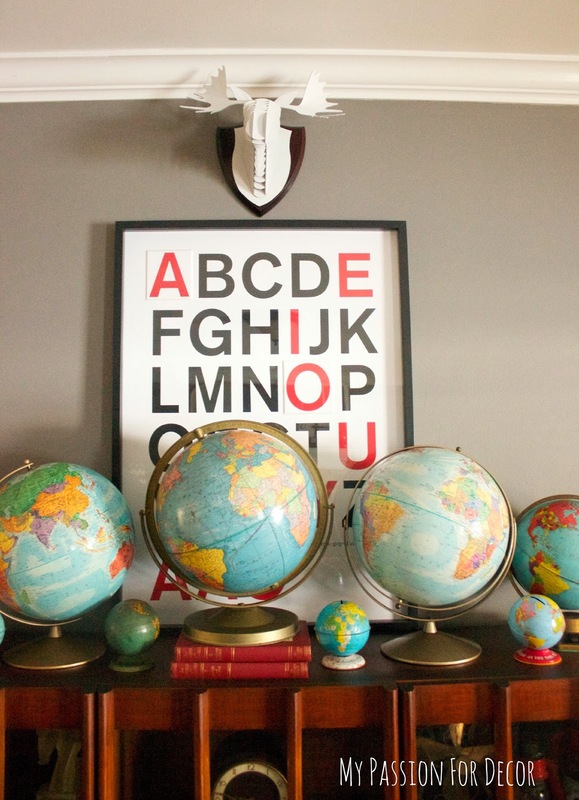 I have a deep love of globes and maps, which is apparent when you walk into my home! I hope you'll come along with me on this vintage inspired journey. A Quick Update and a House Tour! It's Time For A Fun Michaels Pinterest Party!! The Big Back Breaker Project! Please note that this blog was created for entertainment purposes only. You can read my full disclosure here.